Spring is here and Easter is just around the corner! If you're looking for a quick, easy, and totally last-minute Easter egg-stuffer, please consider making this cute, pint-sized bunny! Note that I tried to cleverly name this pattern, "Some-BUNNY To Love", because this little bunlet sure is something precious to make and LOVE. Sorry for the pun, haha! This project was also part of my very first Creator Challenge. Crocheters from all over the world have submitted photos of their amazingly creative and unique bunnies! If you're looking for inspiration and ideas, please do check out their work here! Without further ado, I present to you: Some-Bunny To Love! 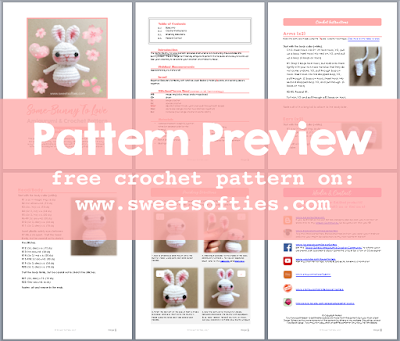 The Some-Bunny Loves You pattern provides instructions for crocheting this adorable, little bunny rabbit! This is a beginner-friendly amigurumi pattern that is quick and easy to work up! Use your creativity to decorate your creation and make it unique. Beginner. Requires familiarity with stitches used (below), making i-cords, and sewing pieces together. Note: The arms are made using the “i-cord” crochet technique. Click here for my video tutorial. Start with the body color (white). To finish, YO and pull through all 3 loops on hook. Fasten off with a long tail to attach to the body later. Gather all the crocheted pieces: arms (x2), ears (x2), head/body. You will also need a yarn needle, scissors, sewing pins, and plastic safety eyes. Sew a small nose and mouth onto the bunny’s face, using pink yarn and a yarn needle. Add blush powder to the inside of the ears and bunny’s cheeks. For tips on applying blush, refer to this video [link] and blog post [link]. Pinch the bottom of the ears in half to make a crease, and sew them onto the bunny’s head using the long yarn tails and a yarn needle. Sew the arms onto the bunny’s body. Optional: Decorate the bunny with appliques (e.g., bow, ribbon, flower), buttons, or more. Use your creativity to make your bunny unique! Congratulations on finishing the "Some-Bunny To Love" pattern!